Update on Sep 6, 2017: This position is now filled. Thank you for your interest. The Environmental Education Associate position is located at the Don Edwards San Francisco Bay National Wildlife Refuge Environmental Education Center in Alviso, CA. The Environmental Education Center provides free programs to schools and the public, while teaching about the local wildlife, conservation, and how to help the environment. The Living Wetlands program is designed to teach about wetlands and the properties of wetlands including watersheds and water conservation. We need a highly motivated individual who has an interest in education and visitor services and will assist in educating, planning, and developing the Living Wetlands program. The Environmental Education Associate will be a part-time employee for the San Francisco Bay Wildlife Society (SFBWS), a non-profit friends group to the Refuge. The primary mission of SFBWS is to promote public awareness and appreciation of the San Francisco Bay and its natural history, and to conserve and preserve the remaining Bay lands as essential wildlife habitat. The Environmental Outreach Associate position is located at the Don Edwards San Francisco Bay National Wildlife Refuge Environmental Education Center in Alviso, CA. The Environmental Education Center provides free programs to schools and the public, while teaching about the local wildlife, conservation, and how to help the environment. The Living Wetlands program is designed to teach about wetlands and the properties of wetlands including watersheds and water conservation. We need a highly motivated individual who has an interest in education and visitor services and will assist in educating, planning, and developing the Living Wetlands program. The Environmental Outreach Associate will be a part-time employee for the San Francisco Bay Wildlife Society (SFBWS), a non-profit friends group to the Refuge. The primary mission of SFBWS is to promote public awareness and appreciation of the San Francisco Bay and its natural history, and to conserve and preserve the remaining Bay lands as essential wildlife habitat. Don Edwards San Francisco Bay National Wildlife Refuge and REI Outdoor School present The Amazing Refuge Race. 2 Marshlands Rd, Fremont • August 19, 2017 • 10:30 a.m. – 12:00 p.m.
Armed with GPS units, you and your team will “race” against other teams by attempting to complete required taskson the refuge first. Teams will be given a set of coordinates where they must try to locate using a GPS unit. Once at that location, teams must work together to complete a task. When that task is completed, teams will receive the next set of coordinates. Those who complete all tasks and arrive at the finish first wins! Intrigued? 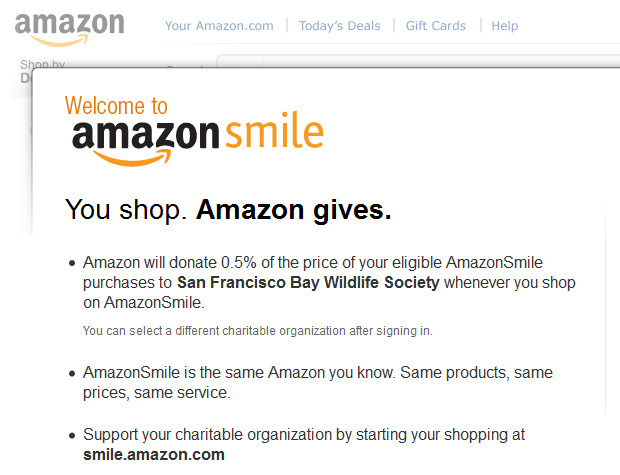 Log on to http://www.fws.gov/refuge/don_edwards_san_francisco_bay or call Carmen at 510-792-0222 ext. 476 for additional information and rules. Don’t have a GPS unit? Borrow one of ours! Registration is required! You may register up to 5 people for your team. A minimum of 2 people per team. The refuge may place individuals on teams containing fewer than 5 people to ensure maximum participation. Registration deadline is August 17. Go to amazingrefugerace.eventbrite.com or call 510-792-0222 ext. 476 to register. There is no cost to enter. John Aird, a fifth-generation Californian who lives in Santa Cruz, had visited the ghost town of Drawbridge, CA decades ago when a few people were still living there. Now he’s back and curious about its history. 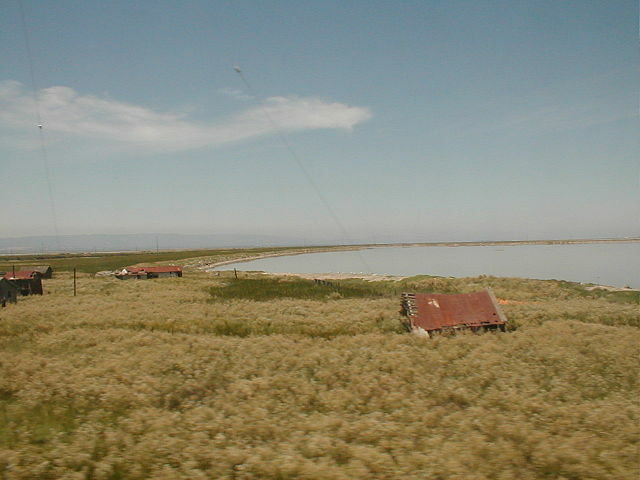 A podcast by Bay Curious answers his questions about the island ghost town in the middle of the Don Edwards San Francisco Bay National Wildlife Refuge. and read the accompanying KQED News article. 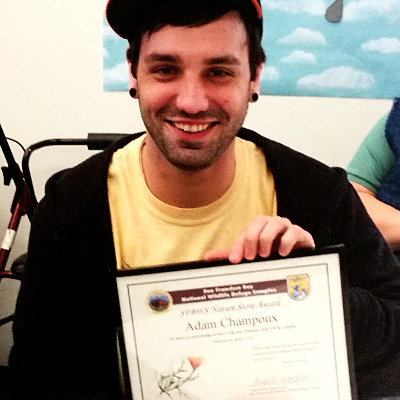 Adam Champoux was named 2017 Volunteer of the Year at the Don Edwards San Francisco Bay National Wildlife Refuge. Credit Colter Cook. On Saturday April 1, 2017 I joined the staff of the Don Edwards San Francisco Bay National Wildlife Refuge and the San Francisco Bay Wildlife Society to welcome and thank a large number of refuge volunteers at the annual volunteer appreciation luncheon in Fremont. The San Francisco Bay National Wildlife Refuge Complex Volunteer of the Year was Ken Roux, a retired member of law enforcement who supports the Environment Education Center Marsh-In summer camp every year by providing security during the overnight sleepover. Ken also trains interns, conducts interpretive programs, and volunteers at several special events. Volunteers who contributed many hours and in unique situations were recognized as well: Larry Rosenblum was named Rookie Volunteer of the Year, and the Environmental Education Restoration Crew was named Team Volunteers of the Year. 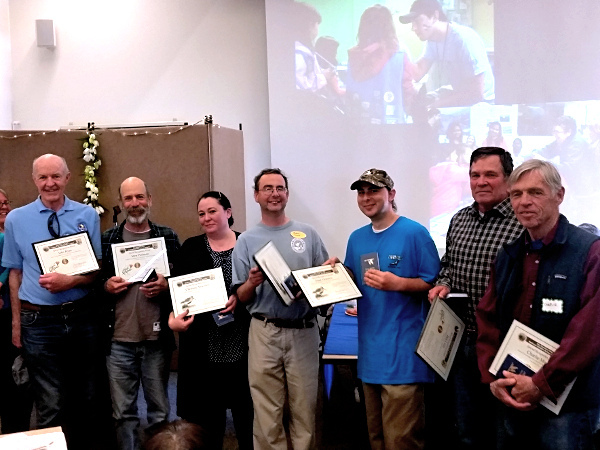 Volunteers who contributed many hours and in unique situations were recognized at the 2017 Annual Volunteer Appreciation Banquet held at the Don Edwards San Francisco Bay National Wildlife Refuge. Credit Colter Cook. Mary Deschene, the Society’s Program Administrator, recognized Adam Champoux for his work in the Fremont Nature Store. I am always inspired and encouraged by the many volunteers, young and old, singles and families, who give their most precious gift to us: their time and labor. Thank you all! Join the Sea Shepherd Conservation Society in our first in-house feature length documentary on the sandy shores of Costa Rica. In the documentary Why Just One? the Sea Shepherd crew tackles a vexing paradox: trying to prevent the poaching of sea turtle eggs in Costa Rica when the activity is legal in one beach town, Ostional, on the country’s Pacific coast. This legal loophole fuels and enables egg poaching throughout Costa Rica. In Why Just One?, Sea Shepherd explores the widely accepted statistic that just one in one thousand sea turtle hatchlings survive to maturity. This is a one hour film appropriate for ages 10+, or at your own discretion. A brief Q&A will follow the showing. U.S. Fish and Wildlife Service Don Edwards San Francisco Bay National Wildlife Refuge Volunteer Opportunities: Summer 2017 at the Environmental Education Center (Alviso, California).